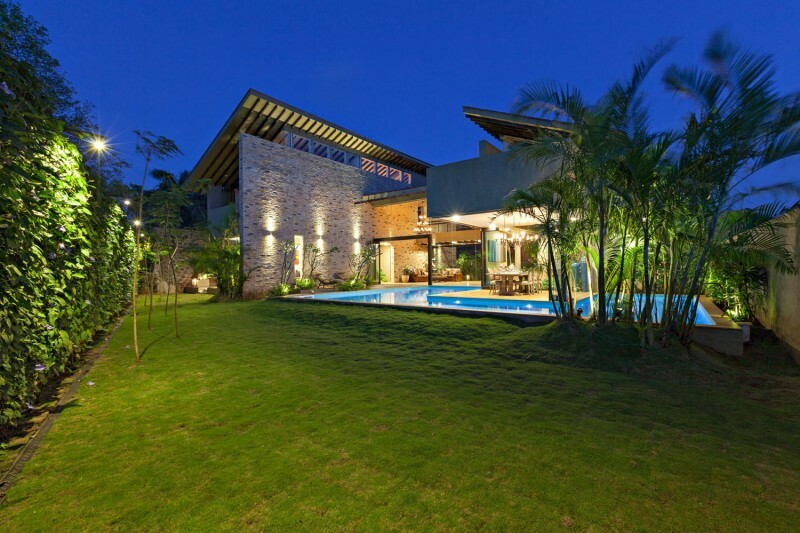 Monsoon Retreat by Abraham John ARCHITECTS. 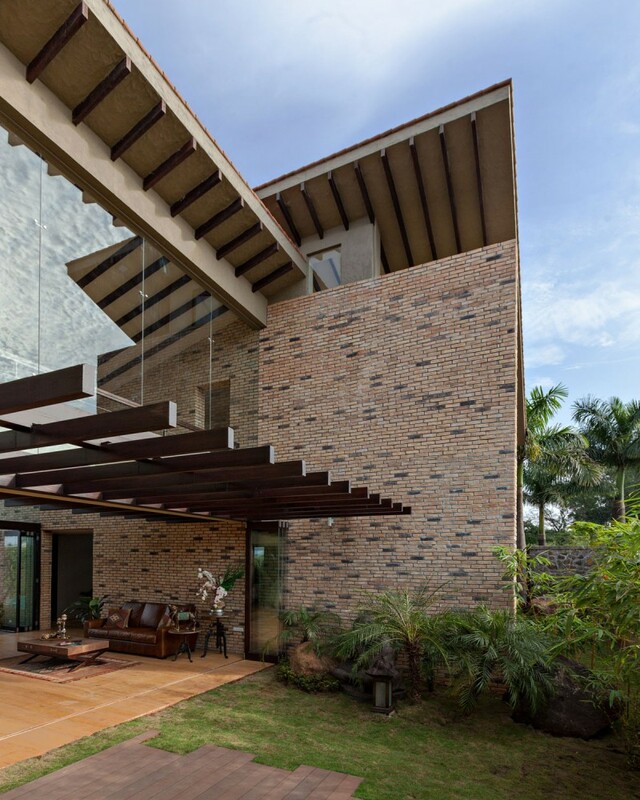 Monsoon Retreat is a private residence completed in 2013 by Abraham John ARCHITECTS and is located in Khandala, Maharashtra, India. The living room was conceived as an “outdoor space” with abundant light and natural ventilation. It opens onto decks and gardens on either side, in keeping with the concept. A continuous wall serves as a textured backdrop to the living room and continues onto the deck, lending it a rustic feel. The cantilevered wood and steel staircase connecting the two floors is set against imposing double height windows; it is bathed in light, allowing luxuriant indoor plants to thrive. The indoor courtyard pathway continues from the staircase area towards the garden. Showers of light are suspended from the ceiling creating a serene ambience. The open floor plan makes the Living – Dining – Swimming Pool and Deck areas feel like an expansive lounge. The Dining Room suspends over the private pool, giving the room an island-like feel; the tree in the dining area adds an element of surprise. The Dining island becomes an exotic “outdoor” space where one can enjoy the breeze, the proximity to the water and to the greenery. 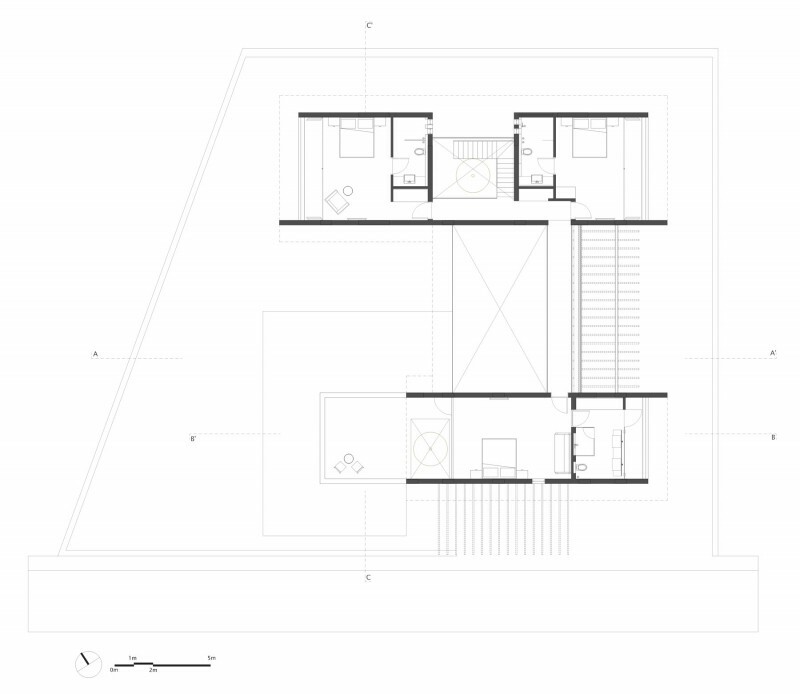 Three bedrooms are situated on the first floor. The master bedroom is separated from the other two bedrooms via a bridge that spans across the double height space of the living room. The Master Bedroom is a complete suite by itself, made up of a large bedroom looking onto a private terrace, a master bathroom and a walk-in wardrobe. Wooden rafters span the entire Master Suite ceiling, giving it an earthy, out-of-town feel. The bedroom’s wooden flooring brings in beauty and warmth. A walk-on skylight is a unique feature between the bedroom and the terrace overlooking the garden. The villa is designed in response to site conditions. Sloping roofs have been designed to withstand the extreme monsoons rains experienced in the area. This house allows one to experience nature. The indoor/outdoor boundaries disappear as every room opens up to a private outdoor space (terrace or garden). Outdoor decks and landscaped gardens serve as expansive entertaining areas with artful illumination and mood lighting. Indoor courtyards, skylights, double height sliding-folding windows add to the outdoor feel. Light and shadow add warmth & texture. The carefully chosen, limited palette of materials ensures consistency in design, minimises maintenance and encourages sustainability. Spaces created harmonise with their surroundings and encourage sustainability by using “green” materials that accentuate warmth & transparency, whilst ageing beautifully: natural sandstone & engineered wooden flooring, large sliding and openable double–glazed windows, which cut down on solar radiation and air conditioning load, allowing for uninterrupted views and access to landscaped areas; automation & LED lights reduce electrical consumption. Cross ventilation ensures minimum use of the AC. The Villa showcases Five Bedrooms (optional Media Room) with attached Bathrooms and balconies. In addition there is a Staff Room, a Kitchen and a Powder Room. Landscape and lighting design play an essential role in the project: outdoor areas and even indoor courtyards, namely the staircase and dining courtyards abound with greenery. Earth was mounded up, boulders & exotic plants were added to create an interesting entrance. The parking area was paved using green paver blocks which allow grass to grow. This entry was posted in bathroom, bedroom, house, kitchen, living, outdoor, pool, terrace and tagged Abraham John ARCHITECTS, bathroom, bedroom, home, house, house idea, houseidea, India, Khandala, kitchen, living, Maharashtra, Monsoon Retreat, myhouseidea, outdoor, pool, terrace, villa on March 9, 2014 by admin.